There are at least 150 steps in the creation process of a handmade fountain pen. If we add the surface finishing and decorating, the number of processes is even greater. All Nakaya pens are made by hand, from barrel turning, metal working, to the nib adjustment and finishing. Every fountain pen must be fine-tuned by a master with the utmost precision. The most popular pen the company produces is the Wajima-nuri. These are very special pens that have been coated with numerous layers of Japanese urushi. They are available in black, red, green and blue with the most sought after one being the tamenuri (black/red) finish. This finish is comprised of a basecoat of red covered in black lacquer. The top coats become transparent with time and allow the red undercoats to show through. My Nakaya is the Kuro-Tamenuri (Black-Red) Urushi finish. The subtle undertone of red is impossible to photograph - the pen must be seen to have its true beauty be be fully appreciated. If simplicity is the highest form of elegance, this is it. As unadorned as this pen is, it achieves greatness by virtue of its materials, surface and color. This pen is truly unique because it reflects the time honored tradition of urushi application, where a glow is created from within of a lighter color showing through the darker outer color. As these pens age with much time in the hand, the glow increases. The inner color becomes more dominant. Nakaya handmade fountain pens come in a handcrafted wooden box as shown at right and are wrapped in a "pen kimono" (the blue fabric at left of pen) to keep the urushi finish protected. Urushi is a material made from the sap of the Japanese urushi lacquer tree. The process of collecting the Urushi (sap) and applying many layers of lacquer to this fountain pen takes three months to complete. The Urushi tradition is historic and profound in Japan, where lacquer ware has adorned utilitarian objects for centuries. This technique, though painstaking, gives this fountain pen its deep lustrous sheen and subtle color shift. Urushi (pronounced "oo-roo-shee") is one of the most durable natural lacquers known to man. Urushi lacquered ornaments including bracelets have been discovered in Japan dating from the Jomon period 9,000 years ago. In the west, these objects are also referred to as "japaned" objects. The special lacquer made from the sap of the urushi tree has been considered such a valuable commodity that urushi trees were planted all over Japan during the Edo period (1603-1868). However, the areas today where urushi sap is actually produced are very limited. The amount of sap collected from each tree is only around 250 milliliters per year, which makes it a rather precious substance. In Japanese culture an old object gains respect and value by virtue of its service and careful wear. My Nakaya pen is just this sort of object. With proper care, it will last generations and become all the more appreciated as a result of its use. Ryosuke Namiki, founder of Pilot, realized during his tenure as a professor at the Tokyo Merchant Marine College that drawing pens needed improvement. After making a prototype fountain pen, he started manufacturing and selling fountain pens with a colleague in 1918. The company was known as The Namiki Manufacturing Company, was renamed The Pilot Pen Co. Ltd in 1938, and renamed again in 1989 as Pilot Corporation. Since Namiki was Pilot's former corporate name, it was a natural name to use for its high end line of beautiful writing instruments. Today Namiki's unique features and designs are their trademarks. The Vanishing Point-still the only click-retractable fountain pen in the business, was introduced in 1964 and has been pleasing pen enthusiasts for over 30 years. Namiki's use of the Japanese art of Maki-e, which incorporates lacquer and powdered gold onto writing instruments for beautiful effects, is among the best in the business. My Namiki Vanishing Point in Blue Carbonesque with a Richard Binder .7mm Stub Italic nib. My Namiki Custom Impressions in blue/gray Italian celluloid. Purchased at the 2009 New York City Pen Show. While at the show I had it fine tuned by the great nibmeister John Mottishaw. Above is a fascinating pen - My Pilot Custom 823. Does this look like a black pen to you? Guess again - it's not. The barrel is actually translucent so that you can see the amount of ink inside! I cannot photograph this properly but Bill Riepl at Stylophiles did a wonderful job of that. Read the entire story of this remarkable pen and see all the great photos by Bill at http://www.stylophilesonline.com/01-06/01823.htm . Noodler's Ink Fountain Pens. Noodler's Ink has been a favorite among pen collectors for many years. Developed by US pen collector Nathan Tardit in Massachusetts, the ink is famous for its "bulletproof" qualities. This means that it is almost impossible to erase, unaffected by water and even bleach! This makes it an ideal fountain pen ink for those who desire these qualities for things like signing legal documents, writing checks, addressing envelopes or anywhere that "archival" quality is desired. Why am I talking about ink on my fountain pen page? Because Noodlers Ink has also just recently begun selling its own brand of fountain pens. The Noodler’s Ahab Flex Nib Fountain Pen is made of a celluloid derivative. That means that this pen is, technically speaking, biodegradable. This Noodler’s creation comes in a number of beautiful vibrant colors. The design is ingeniously simple. The pen can be easily taken apart and put back together which means that cleaning will be a breeze. The Noodler’s Ahab boasts a steel flex nib at an affordable price. This offer is one not many could refuse, because it's not often that you get quality at an affordable price! I own four Noodler's Ahab Pens shown above: The Clear Demonstrator, Cobalt Blue Demonstrator, Ruby Red Demonstrator and the Solid Black (which I call my "Black Beauty"!). I must say that I am extremely impressed with every aspect of these quality pens! First of all, the pen is a large pen - about the same size as a Mont Blanc 146 and it has a wonderfully large nib that matches. Each of these pens writes extremely smooth. The nibs are flexible and these pens write as well (and in some cases better) than pens costing hundreds more!!! The filling mechanism is a unique "syringe fill" that fills easily and completely with two strokes. If you want it can also be easily made into an eyedropper (meaning you can fill the entire barrel with ink and write for days on end without refilling). Don't you think a pen like this would cost a lot? Guess again - the price is an incredible 20.00!!!!! I bought my Noodler's pens from isellpens.com and I can't remember the last time I got a real value like this one! In a world where industrialization has meant massive scale production, mechanization and automation of assembly lines, OMAS still continues to work in the traditional way. For OMAS, skillfully hand made pens are objects of beauty. OMAS pens seduce you with their extraordinary lightness, polished shine, and surprisingly pleasant feel. OMAS pens are known for their personality and their quality of calligraphy. Armando Simoni founded OMAS (Officina Meccanica "mechanical factory"of Armando Simoni) in 1925 with the philosophy that “a pen should exemplify the pleasure of writing”. His fascination with the artistry and equilibrium of ancient Greek architecture led to the signature Greek frieze pattern on Omas caps. Distinguished by inventiveness, aesthetics, and all things mechanical, Simoni’s company grew and is now viewed as a classic in the world of luxury fountain pens. Each OMAS fountain pen embodies all the passion and expertise of OMAS` skilled craftsmen and is the result of a myriad of delicate operations. Each stage in the process is done painstakingly by hand, from the initial cutting of the 18 carat gold leaf to rolling, trimming, and final shaping, to give OMAS nibs their extraordinary flexibility. That is why it can take up to 100 days to make just one fountain pen. Omas’s attention to the finest details produces instruments that are gems, full of both beauty and precision that enhances the pleasure of writing with a fine pen. Two of my OMAS pens are shown here: my OMAS Black Resin Ogiva model with gold trim above and the OMAS 360 in Venice Blue with gold trim below. These hand made Italian pens are nothing short of amazing in their feel and performance. This wonderful 360 (it is 3 sided - triangular instead of round) was purchased from and tuned by the great nibmeister John Mottishaw (www.nibs.com). The Arte Italiana Collection is a tribute to the original twelve faceted model, designed by Armando Simoni in 1930. It's a modern re-interpretation, due to new materials and finishings, but still resembles a twelve sided Doric column, and provides a precise grip to enhance the pleasure of writing. The Arte Italiana Collection is the perfect combination of refinement and practicality. I have two OMAS pens from the Arte Italiana Celluloid collection: The Milford Wild Celluloid (above) which is deep black and milky white veined, with all trims in rhodium plated palladium. And the stunning Milford Bronze Arco Celluloid (below) which touts beautiful brown shades, enlightened by yellow/orange details which beautifully match its golden finish. Its clip is made of golden phosphoric bronze, while rings are made in golden brass. Arco is not the name of the color but of a design. It denotes a refined composition of subtle shades blending into the basic color at the front of the pen to form a narrow arc with a strikingly beautiful effect. This is perhaps the most beautiful and amazing material I have ever seen on any pen! In 1888 George S. Parker, a telegraphy teacher, started the Parker Pen company in Janesville, Wisconsin in response to his students' complaints that their pens alternated between too much ink flow or no ink flow at all. at the time, he supplemented his teaching salary by selling pens for the John Holland Gold Pen Company, based in Cincinnati, so it wasn't too much of a leap to begin creating his own pens. The changes to the fountain pen industry began with Parker's improvement on the feed, and for the following 30 years, Parker spearheaded the development of fountain pen design. Numerous patents were awarded, including a 1904 patent for a mechanically filled "lever" filler (up to that time almost all pens were eye-drop filler). Parker became a household name, and continues to be one of the most recognizable and trusted writing instrument companies today. I love this pen. It is my Duofold Mosaic Centennial that writes silky smooth! Parker Duofold Centennial Pearl and Black that I purchased at the 2008 NYC Pen Show. What a smooth writer! Parker Duofold International Amber Check - another one of my favorites! 1940 Parker Maxima in Grey from the 2012 Philadelphia Pen Show - This is a sweet, amazing pen! Parker 45's from the 60's in Red above and Blue below - these are some of the best writing pens I have ever used. The smoothness and quality of lines they put down rivals pens costing many times more! Pelikan got its start in 1838 near Hannover, Germany, as a paint and ink factory. After it was sold to employee Gunther Wagner in 1871, the firm adopted the Pelikan name and logo from Wagner's family crest. Since 1878 the Pelikan has been the symbol of a brand that stands for craftsmanship, quality, and perfection. After a half century making writing inks, Pelikan produced its first fountain pen — and the first reliable piston filling system—in 1929. The differential plunger mechanism made easy, reliable, and clean filling of a fountain pen possible for the first time. Today, Pelikan’s products stand in the first rank of pen companies for their legendary beak-shaped clip, casing colors, and top quality nibs. At Pelikan, each fountain pen nib is masterfully shaped, slit, polished, and then written in by hand—nib for nib. Throughout the world - but especially in Europe - Pelikan Fountain Pens compete with the more famous Mont Blanc brand (they are both made in Germany). Although not as widely known as Mont Blanc, they are built much better. I love all my Pelikans - they are simply fantastic writing instruments. The incredible and elegant M-800 in Blue is a large pen and is one of my all time favorites. Like all Pelikans, it has a smooth piston filing mechanism that loads the barrel with lots of ink. This one has a fine nib that I had tuned by John Mottishaw. My red M-800 model has a Richard Binder modified 0.8mm stub italic nib. The smaller and lightweight M200 in Burgundy with a Richard Binder 0.7mm Italic nib is perfect for everyday use which is what I use it for. Another feature I love is the "see through" section towards the front of the barrel that allows me to see exactly how much ink is left. There are plenty of classic pens in the world, but only Retro 51 takes inspiration from the mid 20th century, an age populated with finned cars, propeller-driven passenger planes, and comic-book heroes. Founded in 1990 by George Kartsotis, Texas-based Retro 1951’s designers give it all back to you in a collection of ballpoints, roller balls, and fountain pens. Some even come in sterling silver, some have roller clips, and most are sold at remarkably retro prices. Through constant evolution of style, color, and fabric of construction, Retro 1951 keeps on the leading edge of the writing instrument world. They've introduced colorful fountain pens, each of which evokes a dramatic nostalgia trip. Retro 51's all-important and very true motto: "Life Is Too short To Carry An Ugly Pen!" My Retro 51 is a Double 8 model in a beautiful blue speckled celluloid. My Rotring is an Initial Blue model. This fountain pen's unique APC (air pressure compensation) system prevents drips or leaks up to 30,000 feet (most fountain pens leak in planes - but not this one). The advanced feed system also contains multiple channels for even flow and optimum restart. The contrasting colors of polished and matte silver make the Initial an instrument as contemporary as it is cool. This pen is one of the smoothest writing pens I have ever used and one of my favorite writing instruments. 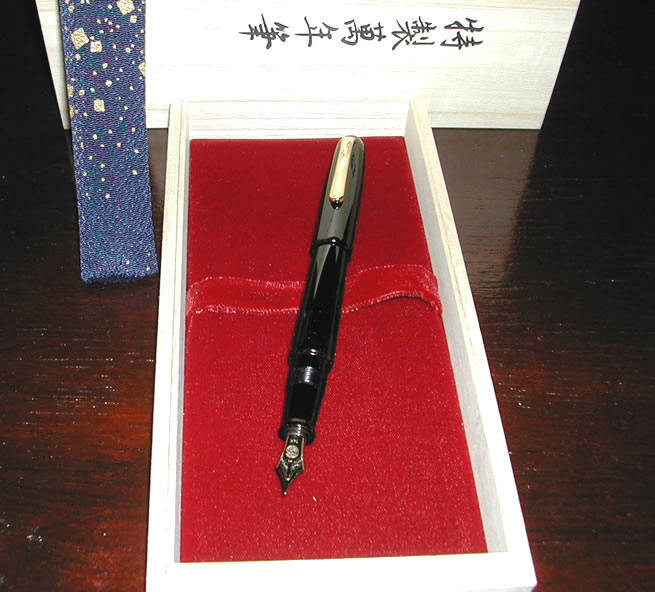 In 1911 Kyugoro Sakata, an engineer out of Hiroshima, was introduced to the fountain pen by a British sailor. Entranced by the function and design of the piece, he decided to start his own company. Sakata named his company Sailor and determined to begin producing the most sophisticated and elegant writing instruments in the world. Here you'll find instruments rendered in gorgeous acrylic resins, natural lacquers, precious and semi-precious metals, mother of pearl, abalone shell, rare woods, and beautified with the Japanese art of Maki-E. Sailor’s fountain pen nibs are also legendary; for decades, their experience in the manufacture and refinement of nibs has made them a choice pen for collectors. They are especially proud to have Mr. Nobuyoshi Nagahara at the helm as Master Nib designer to oversee and direct the design process. Nearly a hundred years after its inception, Sailor Pens continues to offer pens that encompass century-old techniques and craftsmanship, treasures that enhance the pleasures of the writing experience. Above is my Burgundy Sailor 1911 Model - named in honor of the year Sailor was started. I purchased this amazing pen at the NYC Pen Show in September of 2005. I had heard that Sailor pens had the finest nibs in the world and went to the show with the intention of finding one for my own. I found this one and immediately discovered that everything I had heard about the Sailor nibs was true. I am convinced no pen writes smoother than this one! I am sure it is because Master Nib Maker Nobuyoshi Nagahara (called by many as "the god of fountain pens") oversees the nib making at Sailor. This pen is on a par with the Mont Blanc 146 in style, size and quality but writes much smoother. The Sheaffer story begins in 1907 with the invention of the lever filling fountain pen by Walter A. Sheaffer in Fort Madison, Iowa. The fountain pens of the day were cumbersome and messy to refill, requiring an eyedropper and a steady hand. Sheaffer’s dissatisfaction with this inconvenience led him to seek a refilling method that would be simple and clean. The result: the first practical lever filling fountain pen earned Walter Sheaffer a U.S. patent in August of 1908. A single stroke of a slim metal lever filled the pen reservoir directly from the ink bottle. Local reception was so enthusiastic that Sheaffer decided to risk his life savings to establish the W.A. Sheaffer Pen Co. in 1912. Walter Sheaffer's pioneering spirit founded a company and a tradition of inventions, including Skrip® ink (1922), the Touchdown® filling mechanism (1949) and the Inlaid Nib™ (1959). New pen designs were introduced, including the Balance® Lifetime® (1929), PFM™ (1959), and NoNonsense® Models. These and other contributions by Sheaffer to the pen industry continue the tradition of innovation and quality set forth by its' founder nearly a century ago. OK - This is my #1 favorite vintage Pen! It s a Black 1936 Sheaffer Premiere Balance that I bought at the 2005 New York City Pen Show. I then sent the pen to Richard Binder to have it totally rebuilt into perfect original working order and also had the nib reground to a .8mm stub italic which gives this amazing vintage pen a distinctive writing flair. 2006 Sheaffer Valor in Midnight Black (Made in Italy) - Top of the Sheaffer Line! Handmade in Florence Italy, Stipula is one of the premier makers of Italian pens. The name “Stipula” boasts very ancient origins. In the Latin language it literally meant “straw” or “small piece of straw”. But the actual meaning of the word is connected to the widespread use, among the ancient Romans, of stipulating an agreement by splitting a small piece of straw. For Stipula, this name indicts a deep commitment for quality and accuracy, a special agreement made with those who hunt for excellence and indisputable quality in writing instruments. Excellence in the materials and outstanding craftsmanship “Stipula” still preserves the taste and sensitivity to beauty of the traditional Florentine craftsmen’s shops. But also undertakes solutions which, respectful of the ancient rules, make the most of innovations and technological developments. The manufacturing of Stipula fountain pens lays stress on details and always focuses on what makes a writing instrument highly performing, reliable, and attractive for a lifetime. The materials used are indeed beautiful and in every case the color is the absolute protagonist. As for the metal trims of its pens, Stipula exclusively uses massive gold or sterling silver or special finishes obtained with advanced treatments of the surfaces. Clips, rings and all other metal accents are shaped and engraved in line with the precepts of the Florentine goldsmith traditions. The most famous of the Stipula models is the "Etruria," (shown above) a fountain pen named for the ancient land in which it was created. The ancient Etruscans settled these lands, now known as Tuscany, where they practiced their sophisticated metal casting techniques, creating objects that are the essence of craft excellence. The Stipula Etruria pen is turned from nut-colored celluloid rippled with infinite tones of brown with reddish highlights. Accents are cast in sterling silver by the cire-perdue method and highlighted with rings of gold. The Etruria is most representative of the handcraft tradition of Stipula, with beautiful colors and decorative Florentine metalwork. The solid sterling silver rings and clips are hand cast in the same lost wax methods used since the Renaissance. Shown above is a Limited Edition Etruria de Architectura Gaudi Pedrerra. This beautiful pen is made from gorgeous "Cracked Ice" celluloid. This absolutely fantastic material is the highest quality I have seen on any pen of any vintage. Only 193 pieces were made worldwide and mine is number 80 (engraved on the barrel). The Gaudì Pedrera pays homage to the ingenuity and creativity of its namesake, Antonio Gaudì, an architect from Catalonia, Spain, whose unique style and individualistic designs defined him as part of the Art Nouveau movement. The pen’s handcrafted clip and ring are made from solid sterling silver. Above is my Stipula Ventidue which has recently grown to be one of my favorite writers! I love the large .9mm Italic nib that writes so smooth its like gliding on water. I also love the feel and the see-through barrel that lets you see exactly how much ink is left at all times. This pen holds a huge amount of ink so you hardly ever have to fill it. For many years I have yearned for a fountain pen that I could count on to have with me at all times. Sure I have fountain pens in my office at work and on my desk at home, but that is to be expected. They are large and have clips that only fit in my suit pockets and dress shirts. But what does one do on the weekends when you want to wear shorts and a golf shirt with no pockets or maybe even just lounging around in sweatpants and T-shirt? What about having a pen you can take with you anywhere without needing to have a shirt pocket? Answer: Stipula Passaporto - that's what!!! This outstanding pen writes like a champ and is an eyedropper fill to boot!!! It comes with an eyedropper and silicone grease and has an O-Ring on the section to prevent any leakage. When you fill the whole barrel full of ink you can write for days!!!! It holds a ton of ink.Or - you can also use a wimpy cartridge if you want to go that route- but why not "fill 'er up"? Mine is a Limited Edition in Tortoise that is number 4 of 75 made. It never leaves me - ever. Even when I am in my suit at work I still have it in my pocket in case the pen I am using starts running low on ink or something - you never know when it might be needed!!!! !I love this pen and can safely say that it is the only pen in my collection that I carry all the time - every day of the week - at work or at play! Shu-Jen Lin founded Taccia on the core belief that pens should be affordable, stylish, and well-built. She truly believes that pens are the perfect accessory – fun to collect, display, wear, and an intimate form of communication often lost in this internet age. She strives to develop and produce pens that cater to both males and females, young and old, for all occasions – casual and formal-. A pen, like a watch or a car, can help define a person’s style. My Taccia Mother of Pearl Pen above is one of the most stunning pens ever made. It is handmade from carefully selected real mother of pearl from the South Pacific. You would have to see this pen in real life to truly appreciate its beauty as photos can't possibly do it justice. Like classical Greek columns, my Taccia Doric above is simply and solidly designed for writing comfort and balance. The large barrel is crafted in beautiful, vertically-lined resins. The grooved central band, curved clip and engraved grip are solid brass that has been plated with a scratch- resistant gunmetal finish. A small Mother-of-Pearl accent can be found on the clip. My Doric is an amazing Atlantis Blue Color. With the Taccia Momenta above, engineers utilized technological and creative expertise to craft a most impressive pen! Swirling barrels precision-cut to exacting specifications create a twisting, lively writing instrument. Strong lines and prominent rings create an almost inner force within the pen that truly needs to be held to be experienced. With extra attention paid to the balance, the finish, and the accents, the Taccia Staccato was built to be both a daily writer and a stunning pen. Hand turned Italian resin is precision cut and expertly polished by tumbler and by hand for several days to achieve its luster and look. I love my Taccia Staccato! The heralded TWSBI Diamond 530 is a fountain pen born out of input of the Fountain Pen Network community. The Taiwanese manufacturers aimed their design as a pen for fountain pen enthusiasts. And their aim was true, as the Diamond 530 demonstrator was voted as the Goldspot Pen of the Year for 2010. The TWSBI Piston Filling demonstrator fountain pen has been heralded by the online pen community (particularly the folks over at Fountain Pen Network) as a hands-down favorite writer's pen that could easily be compared with Pelikan demonstrators that are double the price. The Diamond 530 uses an internal piston-filling mechanism that holds a generous amount of ink is easy to clean and can be completely disassembled and reassembled using the instruction guide wrench and silicon grease provided. The one question of many pen enthusiasts may be, "what is a TWSBI?" Sure, it's not a brand name like Parker or Waterman, but TWSBI was able to best every established competitor by staying true to the needs of writers. TWSBI has 50 years of manufacturing experience in metal-stamping, metal-turning and plastic injection molding. For 25 years, they have been making OEM writing instruments for well-known brands. Now, their aim is to make their own products under the name TWSBI, starting about a year ago. When I first heard of the Diamond 530 piston-filling fountain pen, I just had to get one. Piston-filling fountain pens are hard to come by at such an affordable price. Based on the price I did not have high expectations, but I was immediately amazed at the superb writing quality and smoothness! The piston mechanism works perfectly, smoothly drawing up the ink and the barrel holds a TON of ink. My TWSBI is easily one of my favorite pens and its performance rivals the performance of pens I own that cost many times its price. Founded in Florence, Italy, in 1988, Visconti is the brainchild of Dante Del Vecchio and Luigi Poli, two innovative and creative-minded fountain pen collectors. Together, they have helped reintroduce celluloid pens with a team of talented artisans whose varied experience and love of fountain pens have renewed the craft of celluloid. Visconti is now the largest celluloid pen factory worldwide and its production has widened to include materials such as ebonite, acrylic, Lucite, bakelite, and ivory. Always interested in technical solutions, Visconti has brought back the crescent filler, and patented a double reservoir power filler as well as a traveling ink pot--perfect for filling your pen without messy ink spills on clothes or luggage. Visconti is considered to be one of the most creative companies for fresh designs, technical innovations, and collectible instruments both traditional and contemporary. My first Visconti is a wonderful Limited Edition Red Wall Street purchased at the 2010 Philadelphia Pen Show from Bryant Greer. The pen is made of gorgeous shades of red stripes in smooth and rich celluloid. Since 1988, the name Visconti has been synonymous with celluloid. The Wall Street Celluloid Collection is made of aged celluloid, the queen of materials, known to pen collectors as both a tradition and innovation in writing instruments. I love the feel of this pen and the see-through ink window in the barrel. This pen is magnificent and photos can simple not show its beauty. If you would like to know more about this pen in detail go to http://www.stylophilesonline.com/09-06/09ws.htm for some truly great photos by Bill Riepl (far better than anything I can do with my camera!) and a full review. Above is the beautiful Visconti Wall Street in grey celluloid. The Wall Street pen is highly symbolic, not only in it's shape (circle/square) but also in the material, which recalls the New York City skyline of which Wall Street is such an important part. The Opera Club above belongs to the Visconti "Squaring the Circle" Collection. Not round as most any other pen and not square for ergonomics. In effect, a square pen with rounded corners! Each colored model is hand carved from a block of luxurious celluloid, laminated in layers to provide a glittering effect. Mine is in a beautiful color called "Cherry Blossom". My next Opera Club is in Marine Blue from the same "Squaring The Circle" Collection. This one has a beautiful blue marbled finish. The last Visconti is a sparkling blue Pericles. The signature of the Visconti Pericle Design is the spring-loaded clip shape that recalls the ancient Grecian helmets. Crafted in beautiful blue acrylic accented by highly polished palladium . How many people are aware that the fine crystal company - Waterford Crystal - also makes fine pens? Known as the most prestigious hand-crafters of crystal in the world, Waterford's reputation began in 1783 when two brothers, George and William Penrose, founded the Waterford Glass House in the ancient Viking city of Waterford. They began a tradition of making crystal in "as fine a quality as any in Europe...in the most elegant style." Their distinctive, deep-cut patterns were brilliant, pure prisms for light. Those same elegant cuts and memorable patterns may be seen in their lines of fine writing instruments. Waterford products are the result of 200 years of uncompromising standards in quality and craftsmanship. From the first stroke of my pen I could see that it's quality was "crystal" clear! My Waterford Pallas is crafted from machined blocks of pure resin in lustrous transparent ocean blue. All bright accents are platinum plated, and the star top cap design, the wedge cut in the spring-loaded clip, and the deep cut lines at the tip all evoke the precise beauty of Waterford's heritage. I bought this great pen at the 2009 NYC Pen Show. Often cited as the inventor of the fountain pen, what Lewis Edson Waterman did was patent a practical fountain pen. He developed a feed that would guide ink down the backside of the nib and onto the paper. The Regular, as he christened the pen, was anything but and was patented in 1884. Waterman would sell these on a small scale until WWI, when his sales would skyrocket and give rise to many copies, despite numerous patents. Today, the Sanford Company retains Waterman's reputation as a company of innovation, quality, and cutting edge design. The name is among the most recognized in the industry, and its enthusiasts can attest to its quality. Every Waterman delivers a crisp, sure signature, just as Lewis Waterman intended. Waterman pens are some of the best writing pens ever made. Although the company started in the USA, they are now made in Paris, France. I find them to be incredibly smooth and ultra reliable - able to write perfectly every time they touch the paper - even if they have been in a drawer for weeks at a time! My Waterman Edson in Blue Sapphire sits at the top of the Waterman line with incredible style, grace and elegance! Waterman Liaison - an elegant and distinguished writing instrument made from Wood Grained Ebonite. This pen was purchased at the 2008 Philadelphia Pen Show and was fine tuned to perfection by Michael Masayuma. Waterman L'Etalon - another elegant and distinguished writing instrument. 1985 Vintage Waterman Opera - This is a rare, Limited production piece that is very hard to find. Here are my two Waterman Carene Models: The Carene Deluxe with Sterling Silver Cap above and the Amber Shimmer Carene below. Both of these Waterman Carenes are among my top favorite writing pens. The Amber Shimmer pen (below) holds a special place in my heart because I purchased it in New York City on September 1st, 2001. I brought it back to my Hotel Room directly across the street from the World Trade Towers which I could see from my hotel window. 10 days later, on 9/11/2001, the Towers were gone. The Waterman above is a 1940 Ideal 3V Model that is beautifully multicolored. The last Waterman is an amazing 1916 fountain pen made from hard black rubber (plastics weren't invented yet!) It has been restored to perfect working order and original condition and still writes beautifully today 95 years later!! !